You hardly ever see a red fire hydrant anymore - now they're yellow, or construction orange, or blue, or two-tone... but not just plain old red. Except you couldn't see it at night. @RonM - They also painted some to look like Snoopy from Peanuts. 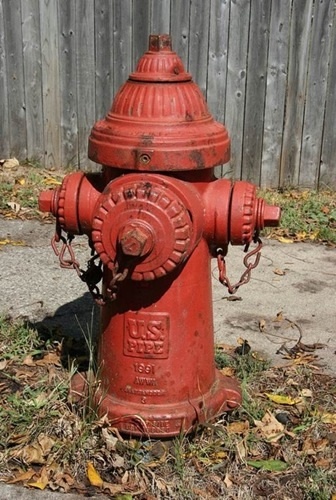 In Manitowoc, WI they quickly repainted them red again when firemen had trouble finding a hydrant that was only couple houses down from a fire they were fighting. That's a Johnny Pump ! My brother got in a fight when we lived in Brooklyn (late 50's-early 60's) and he pushed this kid into a Johnny Pump and hurt him ......he did this after he was pushed into those wrought-iron fences that surrounded the front of the brownstones. Sounds real violent, but both these boys were under the age of 10 !!! We had to move out of Brownsville......too dangerous. I seem to remember during the bicentennial year, 1976, towns were painting the hydrants to look like minute men. I suppose local custom dictates the color. I live in the Upper Midwest and the hydrant in my yard is red. If nothing else, it's more visible in the snow than other colors, such as the funky yellow color I've observed elsewhere.